Respecting and protecting the environment are fundamental values of UNICADOSE® N.A. In accordance with our mission and values, we are committed to minimize the impact of our activities, of our manufacturing practices, of our products and services, on the environment. The material used for manufacturing the UNICADOSE® is 100% recyclable. The non contaminated scraps or rejects from production are re-grinded and used to make the trays in which our ampoules are delivered for the filling with our specially designed machines. The few non conformed parts are collected by a recycling company who uses them for making new plastic products such as bins, chairs, waste cans, benches and much more. The UNICADOSE® are delivered stacked onto pallets and not in carton boxes. The production and conveying of the UNICADOSE® produce 2.6 times less C0² than glass (Source: AVC Bio Intelligence Services 2008). 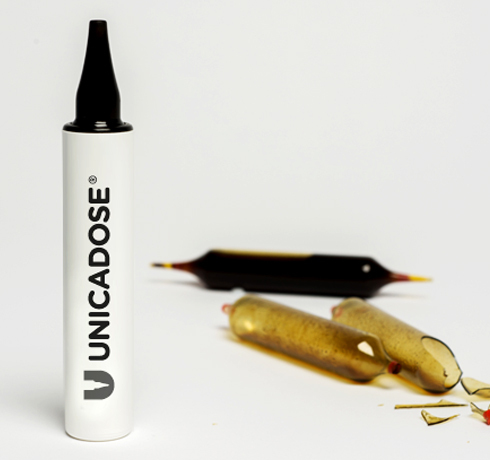 The time required to fill the UNICADOSE® with our high speed filling machines is much lower than with traditional filling systems, therefore requiring the use of less energy. The UNICADOSE®, opposed to glass, does not need to be washed before and after the filling therefore significantly limiting the use of water.